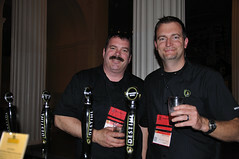 Fred Morissette and Matt Potts from Destihl at the 2010 CBC. I was excited to see a post the other day from Beer Junction that they had just received and stocked 3 beers from Destihl Brewery, which is located in Bloomington, IL. Open since 2007, Destihl has really made a name for themselves in the craft beer scene with their sour and wild ales. I first had the chance to try their sours at the Craft Brewers Conference in Chicago in 2010 and then at the Great American Beer Fest in 2011. I was thoroughly impressed with the quality of the beer both times. Until last year, Destihl barely had the capacity to send beer outside of their taproom and to pour at special events in the Chicago area. But, a 2013 expansion into a larger production facility has seen them fully expand to the Chicago market, as well as several states around the country. They recently signed on with Orcas Distributing to bring their beers to Washington, and they just started arriving this week. I certainly look forward to seeing what sours they will be pouring, and if you are a sour fan, you should be as well. Same thing happening tomorrow night at Chuck’s original location on 85th & Greenwood.